Posted May 17, 2018 by Staff Writer & filed under Arts & Entertainment, Featured Arts & Entertainment. 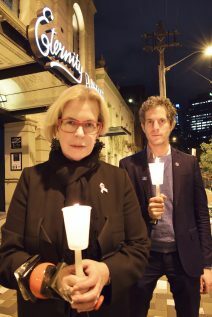 The Sydney Candlelight Memorial will be held at the Eternity Playhouse in Darlinghurst once again to remember, honour and celebrate the lives of those who have passed from HIV or AIDs. Held on International Remembrance Day, the memorial has run for over 18 years as a joint production by ACON and Positive Life NSW to pay tribute as part of a global day of reflection. ACON is a New South Wales-based health organisation specialising in HIV prevention and support. Positive Life NSW is a non-profit, community-based organisation working to promote a positive image of people living with and affected by HIV, with the aim of reducing the stigma attached. This year’s candlelight memorial will feature a performance by the Sydney Gay and Lesbian Choir as well as a speech by Professor Anthony Kelleher, the Head of the Immunovirology and Pathogenesis Program at the Kirby Institute. The memorial will also include its moving tradition of having the names of those who have passed read out by members of the community. The memorial has been valued by the community as a spiritual method of both honouring and paying respect to the lives of those who have passed due to HIV-related illnesses but also to recognise the lives and experiences of people currently living with HIV. The memorial provides some comfort to those currently living with HIV in relation to breaking down the discrimination and prejudice that is often attached to living with the virus. “As HIV and AIDS have gone from being a death sentence to a chronic, manageable condition, there’s been some social acceptance but many people living with HIV continue to feel stigmatised and that needs to change,” says Justin Koonin, the President of ACON. In their fourth quarter report of 2017, the NSW Government reported that 11 percent fewer people had been reported as being newly diagnosed with HIV by the end of the year, compared to the previous six year average. However, despite the lowering rates of diagnosis, the community has voiced concern that a fear of testing or seeking treatment due to discrimination is still of significance for many people. The memorial has provided an opportunity to raise awareness and provide education to all levels of society about living with HIV though. “It’s important that we use the memorial to commemorate people’s lives but also to mobilise and strengthen our response to HIV,” says Costello. For the community, the history of the memorial is intrinsically linked to a better future.